Our Announcements and Press Releases page has the latest news about the Wilson Housing Authority. The Board Meetings and Events Calendar page has a calendar of upcoming meetings of the Board of Commissioners (open to the public) and other upcoming events. 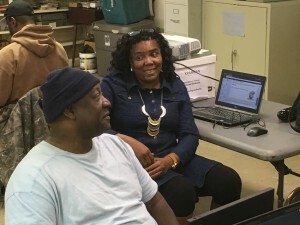 Carolina Family Health Centers Outreach Coordinator Sandra Coley checks the blood sugar level for Wilson Housing Authority resident Jeffrey Little during a free wellness check at C. Bruce Rose Plaza on Wednesday, Jan. 30. Waiting for his turn to get his check done is plaza resident Dennis Artis. 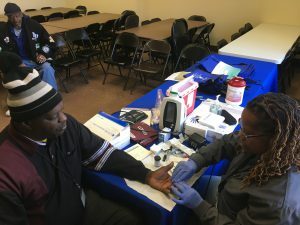 This is the first of three free wellness checks that the Wilson Housing Authority and Carolina Family Health Centers are providing for public housing residents. 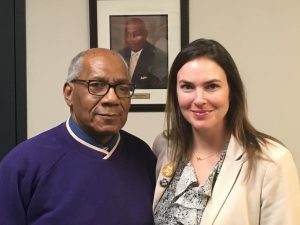 New Wilson Housing Authority Board of Commissioners member Erin Day (right) is congratulated by Board Chairman Thomas Eatmon following her joining the board at its January Meeting. 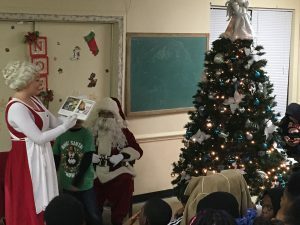 Mrs. Claus reads a special Christmas story to the listening children at the recent Christmas celebration at the Wilson Housing Authority’s EB Jordan Homes. Mr. and Mrs. Claus were on hand to talk to the children and have their pictures taken with them. 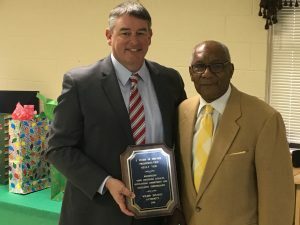 Wilson Housing Authority Board of Commissioner’s Chairman Thomas Eatmon, right, congratulates President and CEO Kelly Vick on five years of leadership for the housing authority. Vick came to the Wilson Housing Authority in 2012 and became its CEO and President in 2013. 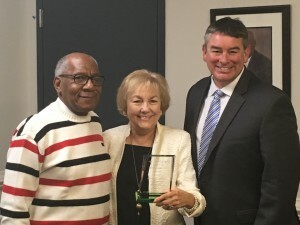 Outgoing Wilson Housing Authority Commissioner Judy Weatherington is recognized for her more than 10 years of service on the housing authority’s Board of Commissioners by Board Chair Thomas Eatmon, left, and Kelly Vick, the authority’s president and CEO. 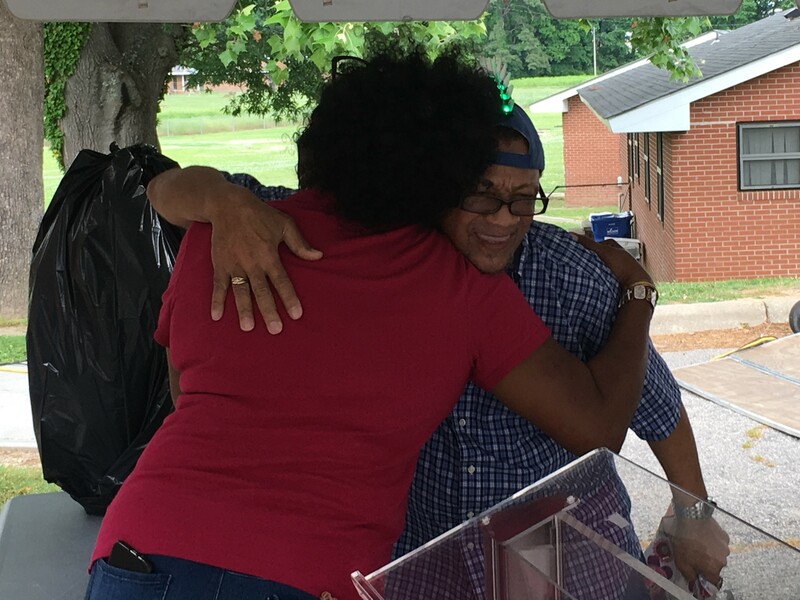 Michelle Hargrove, Manager of the Wilson Housing Authority’s Whitfield Homes, presents Theodore Richardson with his welcome Buddy Bucket. 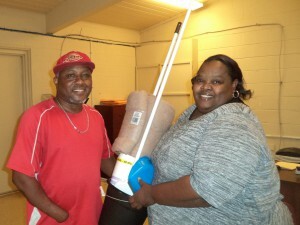 The buckets contain cleaning supplies and other items and were put together by a team of BB&T employees through the bank’s Lighthouse Project and the Wilson Crisis Center to be presented to new public housing residents. 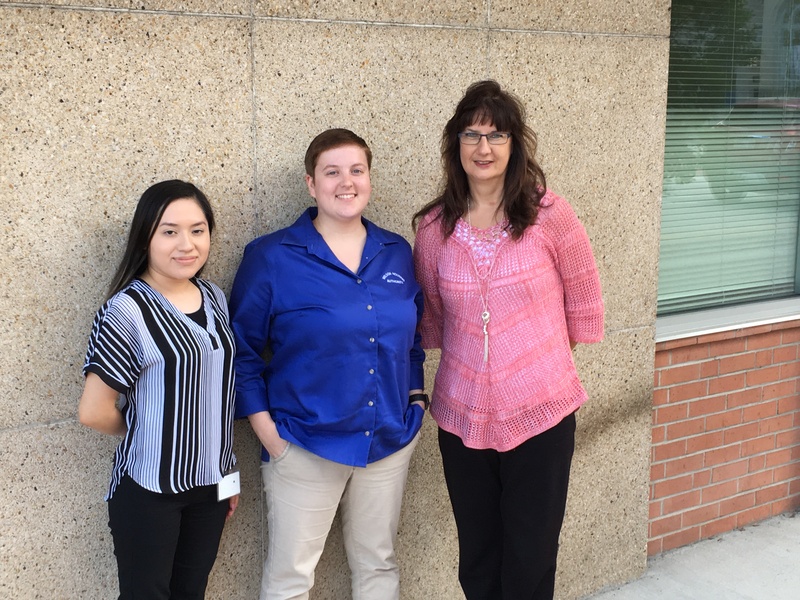 The Wilson Housing Authority’s financial team consists of (from the right) Diana Fish, chief financial officer, Brianna Clayton, senior accounting specialist, and Crystal Vasquez, accounting specialist. 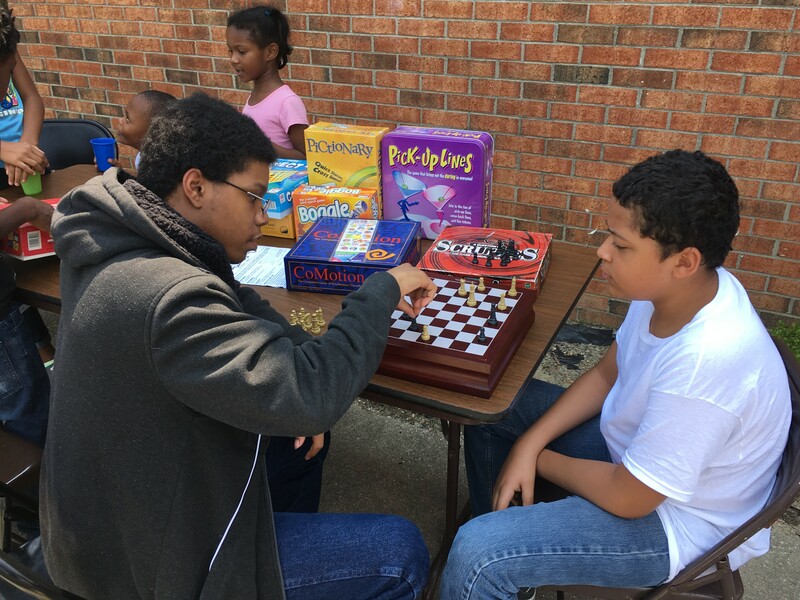 Jeremiah Perez, 13, and Dayvon Rogers, 14, duel each other in a game of chess during the Back 2 School Bash at EB Jordan Homes. 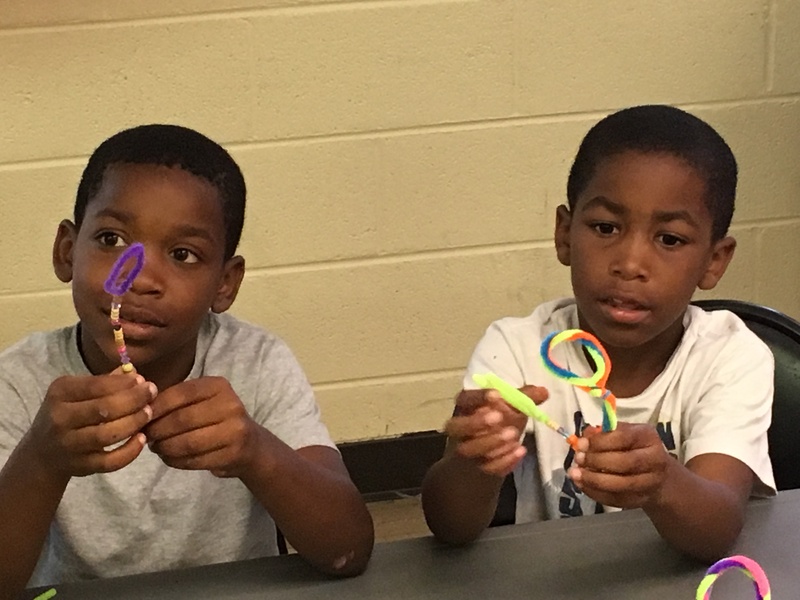 The back to school event was sponsored by the community’s Resident Council and featured games, food, music and a school supply give away for the families in the neighborhood. Carter Manning, 6, looks to make sure he is doing it right before he lays another piece of paper down on top of the marbling mixture he had just mix together. 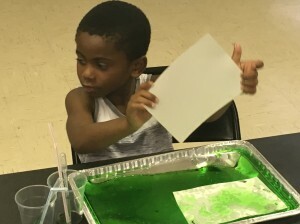 Manning is one of the campers at the arts camp at the Wilson Housing Authority’s Forrest Road Homes. The camps are sponsored by The Arts Council of Wilson. The Wilson Housing Authority’s Senior Day event is all about saying thank you to the authority’s senior residents – and playing a few games along the way. Here, Housing Authority Resident Services Director Cathy Kent gets a big hug from Robert Simon after he gets his prize for playing Let’s Make a Deal. 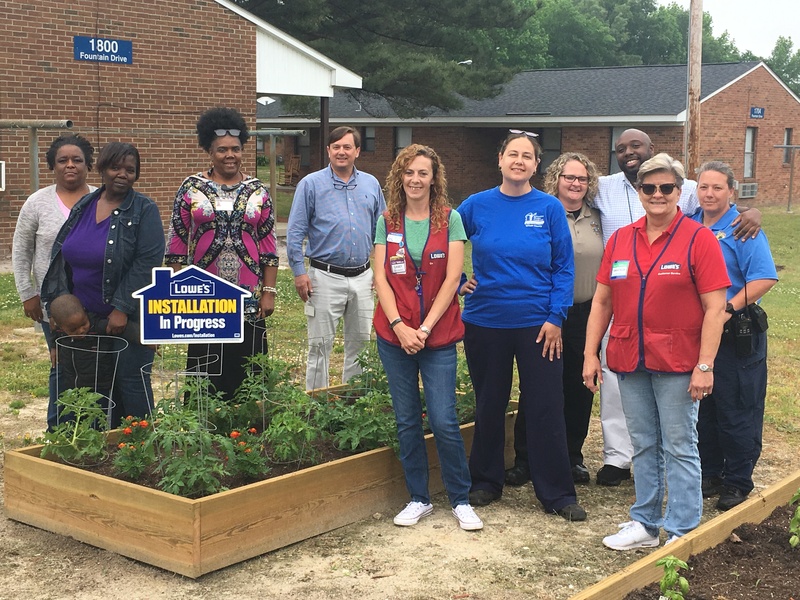 The team that helped build and plant the new Lowe’s Community Gardens at the Wilson Housing Authority’s EB Jordan Homes poses in front of the garden’s tomato bed. 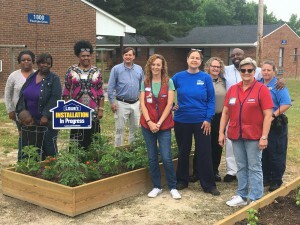 From Left to Right are housing authority residents Karla Evans, Salanda Blount and her son Henry, Housing Authority Resident Services Director Cathy Kent, Housing Authority Development Director Troy Davis, Lowe’s Assistant Store Manager Casey Smith, Master Gardener Julia Newton, Lowe’s Store Manager Vanessa Drew, Senior Wilson Police Officer Kolly Burritt, EB Jordan Homes Specialist Timothy Bastien and Senior Wilson Police Officer Angie Harold. Eight-year-old Aujanae Blakeney of the Forrest Road community helps her cousin, 2-year-old Karmello Taylor, search for eggs during Thursday’s Wilson Housing Authority Easter egg hunt. 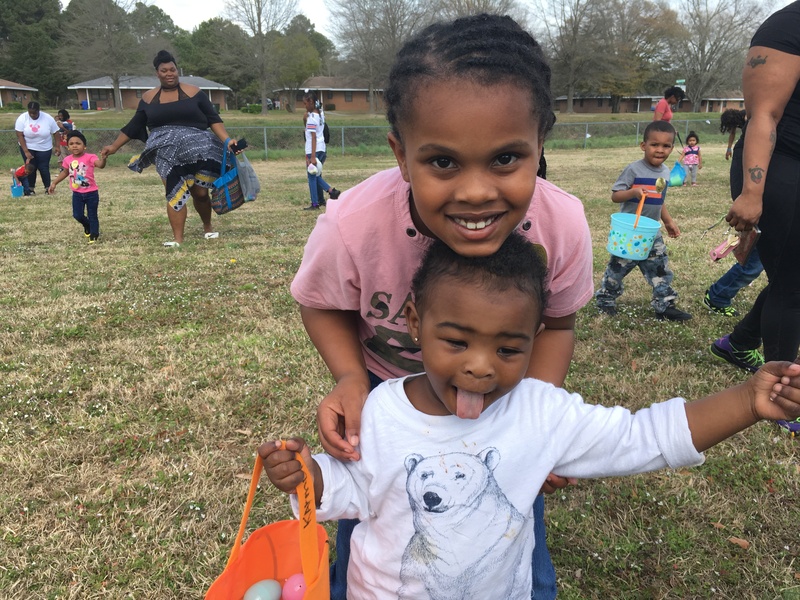 More than 800 eggs were scattered across the field behind the Forrest Road Community Center and Aujanae and Karmello were among the more than 50 kids who searched for them. Wilson Resident Services Director Cathy Kent makes a point to Bobby Whitley while teaching the Wilson Housing Authority’s first digital learning class at Whitfield Homes Community Center. Once the students have attended all four classes, the laptop computers they are working on will become theirs to keep. 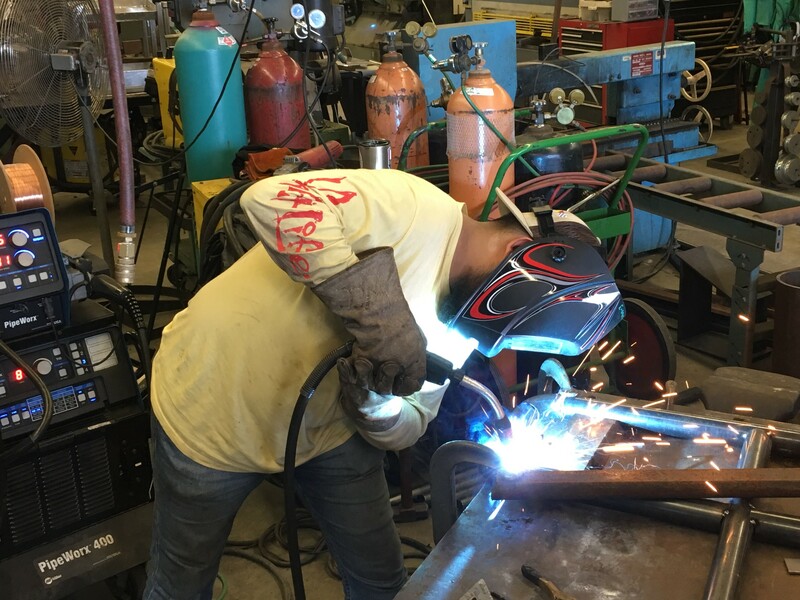 Jorge Ruiz, a student in the Wilson Community College welding class taught by Keith Hobgood, sends sparks flying as he works on the railing for a disabled resident of the Wilson Housing Authority’s Forrest Road Homes. The project will improve the access to the resident and is a partnership between the community college and the housing authority. 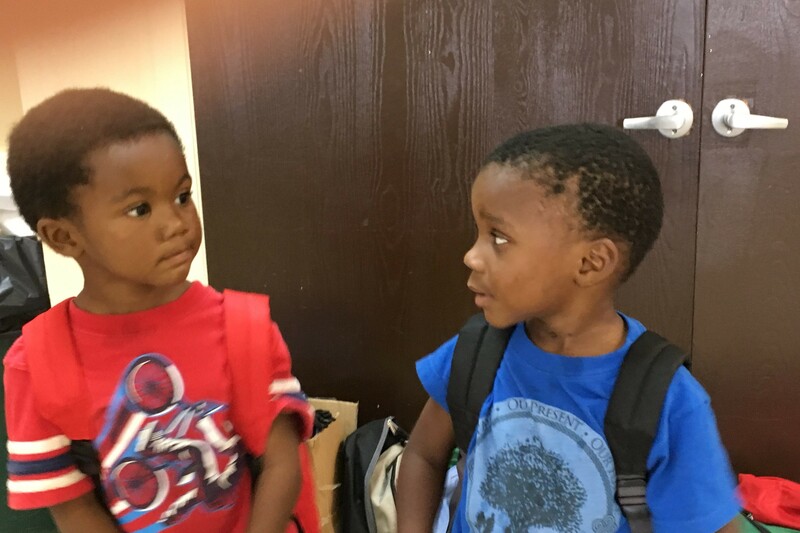 Kahron Wynn (red shirt), 3, and Jaiden Wallace, 4, look to reassure each other that school will be all right after getting backpacks stuffed with school items on Thursday, Aug. 17, at E.B. Jordan Homes. Kahron and Jaiden attend the Head Start program on Pine Street.